1 of 4 Combine sugar, 1/4 cup water and the egg yolks in a medium-size metal bowl. Set bowl over saucepan of simmering water (be sure bottom of bowl is not touching water). 2 of 4 Beat yolk mixture with hand mixer set on medium-high about 5 minutes or until mixture registers 140 degree F on an instant-read thermometer. Continue cooking for 3 minutes, beating constantly. 3 of 4 Remove bowl from over water. Add warm, melted white chocolate and vanilla. Beat about 5 minutes, until cool. 4 of 4 Beat heavy cream in a large bowl to stiff peaks. Gently mix 1/4 of the whipped cream into cooled white chocolate mixture. Fold white chocolate mixture into remaining whipped cream until no streaks remain. Cover and cool in refrigerator for at least 3 hours. 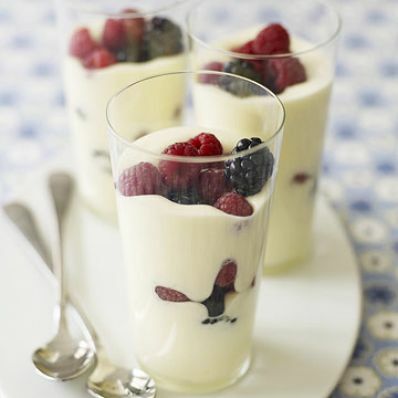 1 of 1 Alternate layers of mousse and berries in glasses or bowls, a scant 2/3 cup mousse per serving. Garnish with an almond or pirouette cookie, if desired.